AFP members are deeply committed to the field of fundraising. Members renew an annual pledge to abide (and to ensure to the best of their ability that all members of their staff abide) by the AFP Code of Ethical Principles & Standards. 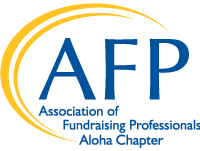 Aloha Chapter members foster the development and growth of fundraisers to benefit all aspects of society in Hawaii. In addition, the Aloha Chapter advances philanthropy through engaging people and organizations to practice ethical and effective fundraising with our special spirit of aloha. Members are challenged to consider striving for a professional credential, whether the Certified Fundraising Executive (CFRE) or other advanced degree. Every Aloha Chapter Member receives a detailed membership directory each year. Contact our chapter office to receive your FREE updated directory in a detailed version today! The decision you make to join AFP will have more influence on your organization’s fundraising success than anything the economy might do. Consider membership and join the network that is advancing philanthropy through ethical and effective fundraising practices in Hawaii today! Membership Prices & Categories: Learn More!